I want to execute a text file containing SQL queries, in MySQL. If you’re at the MySQL command line mysql> you have to declare the SQL file as source. mysql --user="username" --database="databasename" --password="yourpassword" < "filepath"
I use it this way because when you string it with "" you avoiding wrong path and mistakes with spaces and - and probably more problems with chars that I did not encounter with. With @elcuco comment I suggest using this command with [space] before so it tell bash to ignore saving it in history, this will work out of the box in most bash. mysql --user="username" --database="databasename" -p < "filepath"
Do not specify single quotes. Never is a good practice to pass the password argument directly from the command line, it is saved in the ~/.bash_history file and can be accessible from other applications. Use no quotation. Even if the path contains space(' ') use no quotation at all. If your root drive isn't called "c" then just interchange with what your drive is called. First try backslashes, if they dont work, try the forward slash. If they also don't work, ensure you have your full file path, the .sql extension on the file name, and if your version insists on semi-colons, ensure it's there and try again. Make sure that the Database is created first. I had this error, and tried all the advice i could get to no avail. Finally, the problem was that my folder had a space in the folder name which appearing as a forward-slash in the folder path, once i found and removed it, it worked fine. Not the answer you're looking for? 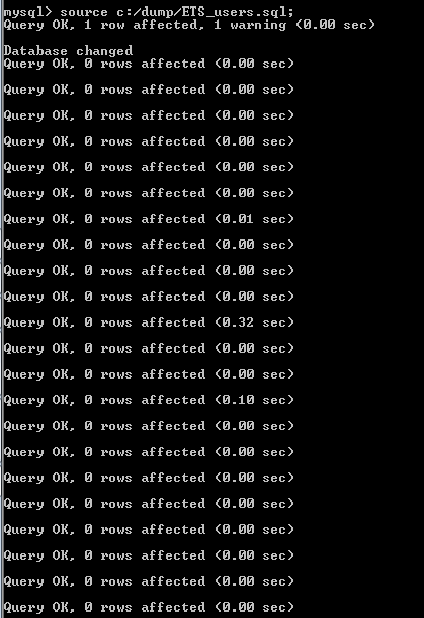 Browse other questions tagged mysql command-line or ask your own question. Is there a faster way to upload data from R to MySql? Are there tools that can execute a SQL script one statement at a time? How to execute sql file from terminal?